This lesson will describe the real-time storm surge products that are issued by the National Hurricane Center (NHC) and National Weather Service Weather Forecast Offices (NWS WFOs) during a significant tropical cyclone event along the Atlantic and Gulf coasts of the United States. Tropical cyclones that threaten a coastline have the potential to inflict devastating damage to communities. Real-time storm surge information will assist decision-makers in their plans and preparation work for these events. Basic familiarity with probabilistic forecast guidance is required. It is recommended that users review the "Forecasting Tropical Cyclone Storm Surge" lesson on MetEd before viewing this lesson. Overall, this lesson was good. However, the lesson could use more examples to help clarify things. That is the reason I gave it 4 stars. Plus, the word "situation" was misspelled. The lesson has it spelled "siutation. This need to be corrected. Important information for those communicating the threat of storm surge flooding associated with tropical cyclones. This a very good module. 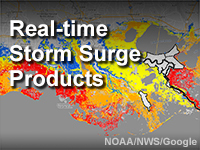 Storm surge watches and warnings are now official forecast products. I figured the newer colored Potential Storm Surge Flooding Map was pretty self explanatory, but this shed some more facts on what the product is actually showing, how conclusions/decisions are made on the Storm Surge Watch/Warning graphics, and other related information. I would recommend this to anyone who is interested in tropical systems, officials that will have to make decisions when tropical systems approach, weather media that helps spread these p-surge graphics so they can actually explain what is being shown and not just say we're expecting this (because lesson says it's NOT showing the 'expected' surge, but rather what could occur at individual locations! ), or anyone who follows tropical systems and will be glancing at these surge products/maps any season. Until changed, note that the storm surge watches/warnings page should indicate that those products are now OFFICIAL NHC products (as of Spring 2017). real-time storm surge products, probabilistic storm surge, Potential Storm Surge Flooding Map, Storm Surge Watch/Warning, NWS Surge Products, inundation, above ground level, decision-making, storm surge, Hurricane Local Statement, exceedance, Tropical Cyclone Public Advisory, WFO, WFO local products, Tropical Cyclone Watch/Warning Statement. March 1, 2018: The products (and product descriptions) in the module have been updated to reflect the current state of the storm surge operational process. A section describing the National Hurricane Center’s Tropical Cyclone Public Advisory and the derivation of the Tropical Cyclone Watch/Warning Statement were also added.